Chromosomes are found in a cell’s nucleus and are made up of tightly wound stretches of DNA, the genetic code essential for the life of the cell and therefore the life of the individual. The nucleus is a protected environment, nothing can get inside it and neither can DNA move outside it. In order to deliver instructions (as code) for a myriad of cell processes, short stretches of DNA are duplicated as molecules known as RNAs, of which there are several forms. The RNA we are interested in here is messenger RNA or mRNA. 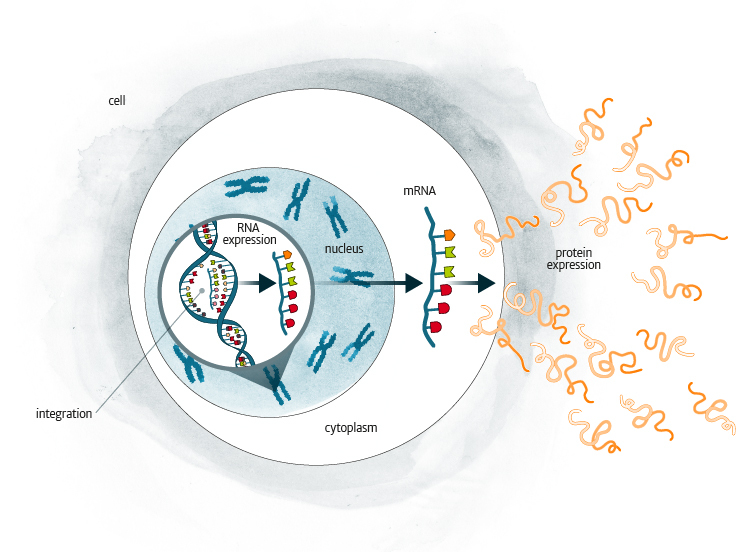 RNA travels outside the nucleus into the cell cytoplasm where protein tyrosine kinases are formed. Proteins express signals, setting in motion a variety of cell processes including division, proliferation and cell death (apoptosis). In CML the BCR-ABL1 gene duplicates its coded instruction as a messenger RNA (mRNA). In this form the DNA code moves outside of the nucleus into the cytoplasm where the protein Bcr-Abl1 signals the Ph+ cells to divide in a deregulated (leukaemic) manner. Tyrosine kinase inhibitors (TKIs) target the abnormal protein Bcr-Abl1, effectively blocking the signal for continuous Ph+ cell division. This reduces the abnormal Ph+ cell population to very low levels along with the clinical manifestations of CML. Continued TKI therapy is highly effective over the longer term allowing the majority of patients to live out their normal life-span.